Preview now corrected. Thanks for the heads-up bro shivaram..
and just to let all know, this VS will be updated soon. 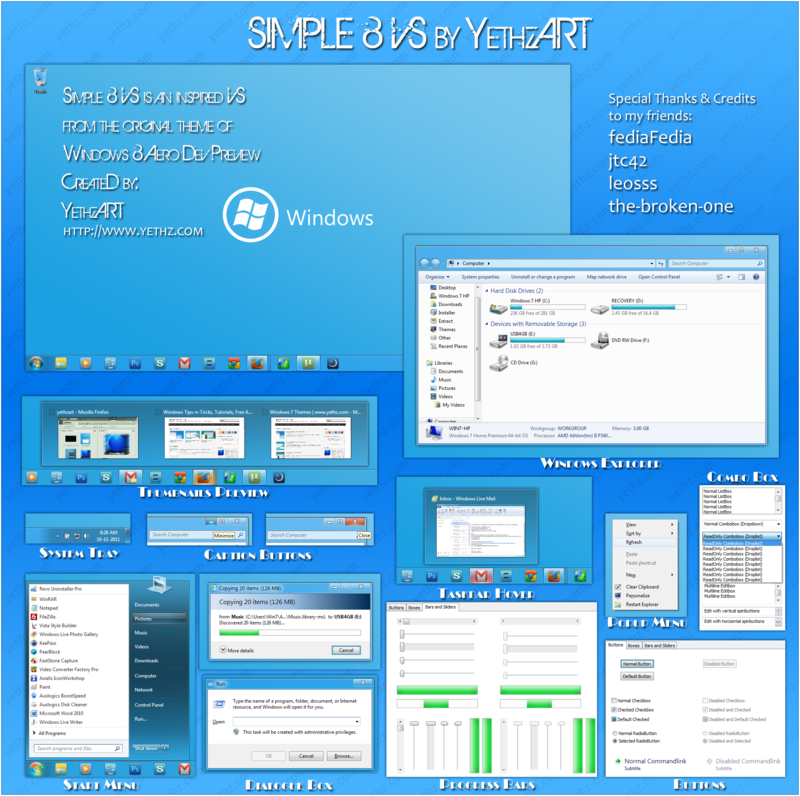 A custom start menu button for Simple 8 Theme, take a look at it here. the Setup File is the revamped one. Link of revamped version is on the bottom of the article. Edited by netbox, 06 May 2012 - 11:49 PM. Other than that... great work! Nice mix of Win7 and Win8. @Preath: Thanks man. I really appreciate that. @all: your comments are appreciated, and comments/suggestions will be noted. +1 for your feedbacks. I did a little update on progress bar and indicator; What do you think? Edited by netbox, 11 November 2011 - 01:14 AM. A combination of Win8 and Win7? I know this idea is gorgeous but the UIs seem probably improvable. Anw, It's a nice work, folk. Re-Download it from this link. Edited by netbox, 11 November 2011 - 04:44 AM. Great job on the progresbars! I love the new progress bars! Edited by netbox, 14 November 2011 - 08:08 AM. Anybody wants a custom start menu button for simple 8? you can check it here. Thank you..
an update of Simple 8 will be publish soon.. minor changes and taskbar, start menu, and bars..
New progress bars, nice. I liked. Looks really good. Well done man. Thanks. Im glad that many likes it. Icon pack is not available..
as of this posting date. I am already satisfied with this changes. Edited by netbox, 23 November 2011 - 01:22 PM.